Pet parents always want the best for their dogs especially when it comes to their nutrition. Unfortunately, the market is literally flooded with so many competing brands each with its own take on what constitutes the best diet for man’s best friend that it becomes quite impossible to discern the really good ones from the popular ones. This is where one’s understanding of the different ingredients in a dog food formulation can come in. One brand that is aiming to be really good for pets without claiming to be popular is NutriSource dog food. In this NutriSource dog food review we’ll look at the things that make this brand a good choice for your pet. For your young Lab, German shepherd, Golden retriever, Rottweiler, or any other large breed of dog, nothing can be more surprisingly flavorful and nutritious than this formulation of Nutri Source dog food. Especially crafted to meet the growing needs of large breeds, this NutriSource puppy food comes with easily-digestible ingredients that are holistically-formulated to bring out a more balanced growth and development of the musculoskeletal system of larger dogs. The addition of fish meal supplies the much-needed DHA and EPA by these young pups while the use of chicken and turkey will surely oversee the normal growth of their muscles as well as other organs. There’s rice, peas, barley, and oatmeal, too that’s guaranteed to pump up your young hound’s energy levels. It doesn’t come with the usual suspects for gluten allergies like corn, wheat, and soy. 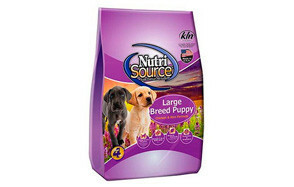 A number of NutriSource puppy food reviews place this as one of the brand’s best. One of the best things about this NutriSource grain free dog food formula is that it is also potato-free. It’s the perfect solution for dogs that may have the propensity to develop hyperglycemia and end up becoming diabetic. The NutriSource dog food ingredients in this formula comprise of 4 key elements: real salmon, menhaden fish, peas, and chicken fat. The leanness of the aquatic proteins makes for well-developed muscles and an improved immune system for your dog. The ingredients are also easy to digest. But its low glycemic potential that makes it appealing to pet parents especially those whose hounds are rather prone to diabetes. This fish-based NutriSource grain free dog food also comes with chondroitin and glucosamine which can aid in maintaining the strength and integrity of your pet’s joints. The probiotics help, too, especially in ensuring the absorption of all the nutrients in this well-balanced formulation. This NutriSource dog food relies on the classic goodness and nutrient-density of chicken to give you a formula that’s guaranteed to be the best possible diet for your adult dog. Enriched with chondroitin and glucosamine, this Chicken & Rice formula is perfect for maintaining the whole-body functioning of grown-up dogs allowing them to enjoy their lives to the fullest. The bioavailability of the formulation is so important that Nutri Source had to carefully select its ingredients, putting barley and brown rice in the top 4 of the NutriSource dog food ingredients list, topped only by premium quality, easily digestible chicken. Probiotics are added to improve the immune system as well as promote healthier and more efficient digestion. The essential fatty acids, especially DHA and EPA, take care of your dog’s continuing brain and immunologic development while caring for its coat and skin at the same time. Small- to medium-sized dog breeds typically have different nutrition requirements compared to their larger cousins. And for that this NutriSource puppy food is always a good choice. Featuring the nutrients from the combination of chicken, menhaden fish, and brown rice your young little hound will surely have all the nutrients it requires to reach adulthood in its fullest potential. The NutriSource dog food is holistically formulated to provide the best possible nutrients necessary for a developing pup, especially DHA for normal brain and eye development. Ensuring a healthier immune system is courtesy of the rich blend of omega-3 fatty acids plus the probiotic organisms that take good care of the developing gut. Vitamins and minerals in the right quantities are ensured to help in the development process. 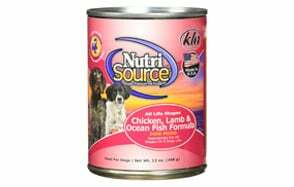 Featuring chicken, lamb, ocean fish, egg, and salmon oil as its key ingredients, this canned food formula from Nutri Source provides a tastier, more nutritious feast for your dog regardless of what stage in life they are currently in. The blend of nutrients make this NutriSource grain free canned dog food to be great for puppies, adults, seniors, and even pregnant and nursing dogs. It’s the goodness of the ocean meeting the stalwarts of land-based premium quality animal proteins. The good news here is that, unlike other canned formulas that use plain water, this NutriSource grain free formulation boasts of the delicious taste of lamb broth as its source of moisture. It’s like giving your pet a very sumptuous meal or as a great way to improve the palatability of its kibble. NutriSource dog food is made by Tuffy’s Pet Foods which was established in 1964 by Darryl Nelson and his son, Kenny. The company is now on its 54thyear of operation and is now headed by the third generation of the Nelson family, Charlie, the grandson of Darryl. Tuffy’s Pet Foods is a perfect example of what a family-owned business is like. Being located in Perham, Minnesota, the business thrives on its partnership with the families in the community that have become the local producers and growers of the finest quality ingredients that eventually find their way into the various formulations of the pet food brand. Being a family-run small business, Tuffy’s is all about integrity, compassion, and the indomitable sense of community that have become the cornerstones of their existence and what can be seen in the products that they formulate. One can feel this sense of community in the dog food products as something that these families in Perham would personally give to their dogs. The company makes a variety of dog and cat foods and treats in various regional themes such as Prairie, Woodlands, High Plains, Heartland, Grate Northwest, and Mediterranean. There are also condition-specific diets like Weight Management and Performance. Of course, there are varieties for puppies, seniors, small breeds, large breeds, and ingredient-specific diets. Aside from formulating its pet food products using high quality ingredients, Nutri Source is also one of those few brands that have yet to experience a product recall. Considering that it’s been around for more than half a century, this is quite remarkable. Firm believers of the animal-protein-first philosophy of dog food will definitely love this brand as it places emphasis on the importance of using named and clearly identifiable animal proteins in all of its formulas. If you’re a vegan who also wants your dog to be vegan, then this is clearly not for you. Pet lovers who don’t like having wheat, corn, or soy in the food that they give to their dogs will also rejoice with this brand. It comes in grain free formulation that helps ensure friendlier tummies. This is in addition to the carefully selected ingredients for easier digestibility. If you need dog food that already comes embedded with probiotics for your pet’s optimum digestive and immune system functioning, then this brand is also worthy of choice. In addition to the probiotic organisms that many of its formulations contain, there is also a number of substances that can provide for additional benefits such as healthier skin and coat, better immune system, and improved neurologic functioning. There were 5 NutriSource dog food products that we have included in this NutriSource dog food review. While the brand itself has numerous products that come with a variety of nutrient profiles, we shall limit our ingredient analysis to what we have in this list. An analysis of the NutriSource dog food ingredients reveals the following. As expected, there is great disparity in the protein content for the dry and wet food versions of this brand. For its dry variant, it averages about 27.25% or 30.27% when the 10% moisture has been taken off the computation. The wet or canned variety offers a much better protein profile of 40.9% as dry matter. Unfortunately, there are brands that offer way better protein profiles. We have to point out that, while these levels of proteins are above the minimum required by AAFCO and NRC, they do not reflect what we believe to be a protein-rich diet that is essential for dogs. Some good quality dry dog food brands come with at least 35% in dry matter basis while wet varieties come in the higher 40s or mid-50s. This is quite baffling since two to three of the products’ top 5 ingredients are actually animal proteins. This somehow leads us to believe that the brand is not really a primarily animal ingredient-based dog food formulation, but rather plant-based. You’re more than welcome to dispute this, but it’s the only valid conclusion we can arrive at. Ancestral dogs thrived on whole prey that did not contain carbohydrates, only proteins and fats. They do occasionally eat vegetables, fruits, and other carbs, but only when prey isn’t available. Now, you may contend that dogs have already evolved so much that they can now eat basically anything that we give them. Sadly, Mother Nature has not changed the structure of the dog’s gut which, up to the present time, is still that of a predator. On the bright side, NutriSource dog food always makes sure that the first ingredient is a named animal protein. This is unlike some popular brands that put wheat, rice, or even corn as its first ingredient. There were a few instances that an animal ingredient was not named, however. We noted the use of “fish” meal in a few of the products reviewed. We’re wondering what kind of “fish” is exactly in the formula. The wet dog food version of NutriSource has one of the highest fat contents we have seen on a dry matter basis. This is computed at 36.36% while its dry dog food version comes in at an average 16.5% or 18.3% as dry matter. 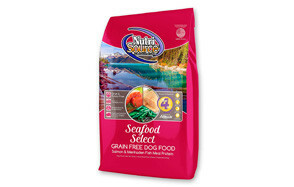 As far as the dry dog food formula is concerned, Nutri Source is well within industry average. However, it’s wet variety that we’re a bit concerned of. As such, we do strongly recommend that the canned version be used more as a food topper than a full meal. The good news is that they do manage to provide near-ideal ratios of omega fatty acids. And while neither AAFCO nor NRC recognizes these as essential nutrients, they do provide a host of benefits to your pet especially for puppies. It’s also good for adults as a means to maintain the health of the skin, coat, immune system, and the heart. We mentioned above that we have this feeling that NutriSource is more of a plant-based dog food with moderate amounts of animal ingredients. The reason for this is that, when we computed for its carbohydrate content factoring the protein and fat components of the dog food brand, we came up with a carbohydrate content of 22.74% for the canned version and 51.43% for the dry version. We don’t see any issue with the canned variety. It’s the dry dog variants that we are primarily concerned about. While there are some who say that dogs can eat anywhere between 30 and 70 percent carbohydrates, this doesn’t reflect their evolutionary diet at all. The 30-70 percent is more like what humans today consume. On a positive note, the brand does away with wheat, corn, and soy as well as potatoes and other high glycemic foods. This should be good news for the pet parents of dogs that are predisposed to diabetes. NutriSource dog food products meet the nutrient requirements specified by the NRC and AAFCO. Whenever appropriate, the brand also includes chelated minerals to improve the nutrition profile. Probiotics, prebiotics, glucosamine, and chondroitin are also included in many of the formulations. NutriSource dog food offers a much better alternative to popular dog food brands. It may not have as high protein content as other high-end dog food brands, but it sure adheres to the principle of using named animal proteins as main ingredient. It may be family-owned, but it sure can compete with larger, multinational company-backed products.